The muscular system of the sheep has much in common with that of all small ruminant species and closely resembles the musculature of all quadruped (four legged) mammals. Due to the sheep's use as a source of food, many sources label the muscles of the sheep in terms of cuts of meat that are intended for human consumption. However, just as with all muscles, the specific muscle names come from classical Greek and Roman roots and were officially derived during the mid- to late 1500s when anatomists were formally labeling mammalian musculature. The muscles of a sheep's head include the sphincters that cause the eyes to open and close and highly developed musculature around the ears to permit movement of the ear to pick up sound. Sheep also have strong jaw muscles for tearing and grinding tough twigs and grasses, and a series of small, well developed muscles around the lip area enable them to manipulate smaller grains and seeds in addition to grasses and brush. As with all four-legged animals, sheep have strong neck muscles designed to enable them to hold their heads aloft and for the purpose of balance when running. The primary muscle groups on the top line of a sheep's shoulders and torso (rhomboid, spinalis and erector groups) are those that parallel the spinal column, providing both support and protection for that structure. The trapezius muscles extend further down along the sides of the shoulder. The thin intercostal muscles are located between the ribs and provide stabilization and protection for the internal organ structures located in the thoracic area of the torso. The pectoralis muscles form the chest section of the sheep. The obliques and latissimus muscles are positioned along the rear and bottom of the torso and serve to stabilize and protect the organs in the abdominal cavity. The muscles of the shoulder area of a sheep consist of three primary muscle groups, the deltoids, biceps and triceps groups. These are heavily developed in meat sheep breeds but less so in breeds created for the purpose of wool production. Flexor and extensor muscles are located below the elbow joint of the sheep and function to permit the forelimb to flex and extend. There are many important but small muscles located all along the forelimb structure that aid in balance and minor movement corrections, however they can be difficult to observe and are often overlooked. The lower forelimb of a sheep has minimal musculature but many tendons and ligaments. The hip muscles of the sheep begin near the site where the vertebral column connects with the pelvis. Included are both the quadratus muscles on the top of the hips and the psoas muscles located below the spinal column, within the bowl created by the pelvis. The primary muscles of the hip area are the gluteus muscles which are responsible for providing much of the power needed for general locomotion. These muscles are often heavily developed among the meat breeds. These hip area muscles are also involved with many of the reproductive functions of both male and female sheep. The primary muscle groups of the hindlimb include those of the hamstring area (semimembranosis, semitendinosis and biceps femoris) and the vastus muscles of the quadriceps area. These muscles, along with the gluteus muscles from the top and the gastrocnemius muscle below create most of the area commonly known as the "ham" or haunch area. These muscles tend to be some of the largest and strongest muscles of a sheep. Based on the concept that form follows function, mammal muscles vary quite a bit in length, thickness, and exact attachment site depending on the function for which they are used. Sheep muscles are uniquely suited for the activities common to most small ruminants, such as grazing, walking on 4 legs, and escaping predators. 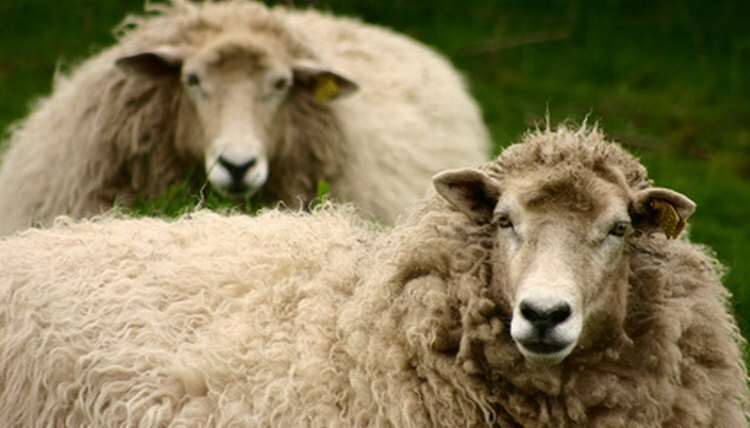 As with many animals, sheep also have small cutaneous muscles immediately below the skin which enable a twitching or shaking movement to dislodge insect pests.